Wales’ capital city connects the plays in this Welsh-language double bill from Theatr Genedlaethol Cymru. While Merched Caerdydd (Cardiff Girls) and Nos Sadwrn o Hyd (Saturday Night Forever) explore universal themes, the characters in them are pure Cardiff. Playwrights Roger Williams and Catrin Dafydd both write vibrant, naturalistic dialogue that taps into the city’s diversity and bilingualism. Williams’ Nos Sadwrn o Hyd has the edge over Dafydd’s play. First performed in English in 1998, it’s a harrowing tale of gay love that still feels current. In this new Welsh translation by Williams, his damning of societal attitudes towards homosexuality gains a lyricism not present in previous English productions. It’s anchored by a riveting performance by Sion Ifan as Lee – 50 minutes in his company fly by. Dafydd’s new play Merched Caerdydd doesn’t afford its actors the same opportunity. It follows three women making difficult choices at a pivotal stage in their lives. However, there’s not enough time to become invested in the characters. The scenes are broken up by well-choreographed movement and there’s a pulsating score by Dyfan Jones, but these only serve as a distraction from the under-developed narratives. Cardiff is the central character in both pieces. 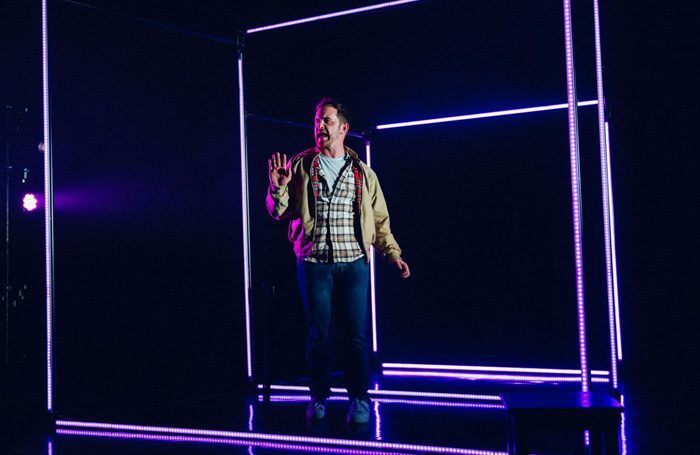 A minimalistic set design from Heledd Rees recalls the city at night and lighting designer Elanor Higgins does a superb job, filling door-shaped spaces with dazzling neon light. Like the people in these stories and the city as a whole, it is at once glamorous and murky.